4.2 is at the release candidate stage and can be grabbed here. This update includes several fixes, refinements, performance improvements and other updates to the user experience and the different layers of APIs. Notably, it concludes the cycle for the formatting API to extend Rich Text components allowing to extend its controls more easily. Adding a new formatting control to inline formatting toolbar. The inserter between blocks has been tweaked so that the experience is consistent with all “add block” buttons — it opens the full inserter now. Show full inserter when clicking + button between blocks. 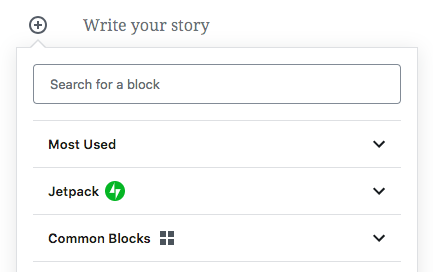 Plugin developers can also register their own block categories and supply them with an icon for better clarity in the block library list. Block categories can display an icon now. Introduce the Formatting API for extending RichText. Use default Inserter for sibling block insertion. Support adding and updating entities in data module. Update block descriptions for added clarity and consistency. Add support for displaying icons in new block categories. Append registered toolbar buttons in RichText. Optimize SlotFill rendering to avoid props destructuring. Optimize Inserter props generation and reconciliation. Improve writing flow by unsetting typing flag if Escape pressed. Add support for non-Latin inputs in slash autocomplete block inserter. Use an animated WP logo for preview screen. Add “img” as a keyword for the Image block. Delay TinyMCE initialisation to focus. Announce number of filtered results from block inserter to screen readers. Add audible feedback for link editing. Avoid focus loss on active tab change within the Sidebar. Add Alt + F10 (navigate to the nearest toolbar) to the shortcut docs and modal. Add some more URL helpers to the url package. Add has-dates class to Latest Posts block if applicable. Improve mobile display of “options” modal. Add “link target” option in Image block. Use currentcolor as border-color for outline button style. Introduce a new middleware to the api-fetch package which adds ?_locale=user to every REST API request. Refactor and optimize withSelect, withDispatch handling of registry change. Refactor and update DropZone context API. Rephrase description of responsive toggle. Ensure buttons on end of row in media-placeholder have no margin on the right. Include implicit core styles in SelectControl. Use better help text for ALT text input. Flatten Inserter mapSelectToProps to optimize rendering. Cleanup Embed code and add better test coverage. Add space above exit code editor button. Return 0 in WordCount if text is empty. Avoid setting a value on the File block download attribute. Set download attribute on File block as empty. Remove Cover block ‘strong’ style. Reduce frequency of actions updating isCaretWithinFormattedText. Add a function to unregister a block style variation. Add lodash deburr to autocomplete so that is works with diacritics. Avoid making WordPress post embeds responsive. Improve handling of centered 1-column galleries with small images. Make pre-publish prompts more generic. Improve the style variation control aria-label. Add missing context to various i18n strings. Add post saving lock APIs so plugins can add and remove locks. Take the viewport size into account when it comes to decide whether to show the button or toggle logic for “submit for review”. Improve accessibility of settings sidebar tabs. Improve the header toolbar aria-label. Add styles to stop Classic block buttons from inheriting italics from themes. Add aria-label to links that open in new windows. Add more descriptive aria-labels for the open and closed states of sidebar settings. Add key event handler to activate block styles with keyboard. Add field that allows changing image alt text from the sidebar in Media & Text. Add aria-label to describe action of featured image update button. Restore displaying formatting shortcuts in toolbar. Add i18n context to “Resolve” button for invalid blocks. Update the editor styles wrapper to avoid specificity issues. Fix converting a reusable block with nested blocks into a static block. Fix regression with mobile toolbar spacing. Fix size regression in block icon. Fix multi-selected warning block highlight. Fix some RichText shortcuts and add e2e tests. Fix issue with tertiary button hit areas. Fix issue with unified toolbar not always fitting in smaller viewports. Fix issue with “remove tag” button in long tag names. Fix rich text value for nested lists. Use color function for defining the background in DateTimePicker. Fix usage of preg_quote() in block parsing. Fix flow of scheduling and then publishing. Fix focus issue on Gallery remove button. Fix keyboard interaction (up/down arrow keys) causing focus to transfer out of the default block’s insertion menu. Fix regression causing dynamic blocks not rendering in the frontend. Fix vertical alignment issue on Media & Text block. Fix some linter errors in master branch. Fix dash line in More/Next-Page blocks. Fix missing Categories block label. Fix embedding and demo tests. Fix issue with vanilla stylesheet. Fix documentation for openModal() and closeModal(). Fix blocks navigation menu SVG icon size. Fix link popover keyboard accessibility. Fix issue with multiselect using shift + arrow. Fix issue with format placeholder. Fix Safari issue where hover outlines sometimes linger. Resolve an issue where the “Copy Post Text” button in the error boundary would not actually copy post text, since it used a legacy retrieval method for post content. Make preview placeholder text translatable. Load translations in the reusable block listing page. Avoid adding isDirty prop to DOM. Improve translation string and replace placeholder handling for MediaPlaceholder instructions. Refactor rich text package to avoid using blocks packages as a dependency. Handle 204 response code in API Fetch. Remove HTML source string normalization. Normalize function arguments in Block API. Add class for -dropdown/-list in Archives block. Update registration method signature of RichText. Add filter for preloading API paths. Add missing @return tag to gutenberg_meta_box_save_redirect() function. Rename id attribute to tipId in DotTip. Use consistent help text in DatePicker. Export both the DropZone and MediaPlaceholder editor components with the withFilters HOC. Remove “half” keyword from Media & Text block. Mark getSettings in Date package as experimental. Remove unused variable fallbacks in RichText. Improve the Toggle Control elements DOM order for better accessibility. Mark Reusable blocks API as experimental pending future refactor. Set correct media type for video poster image and manage focus properly. Avoid PHP notices due to non-available meta boxes. Implement fetchAllMiddleware to handle per_page=-1 through pagination in wp.apiFetch. Add do’s and don’ts to block design documentation. Add styles property to block-api.md. Add documentation for responsive-embeds theme option. Add missing e2e tests for Plugins API. Add an eslint rule to use cross-environment SVG primitives. Use turbo-combine-reducers in place of Redux. Swap the implementation of combineReducers from Redux to a performance-optimized drop-in variant. Update @wordpress/hooks README to include namespace mention. Expose setUnregisteredTypeHandlerName / getUnregisteredTypeHandlerName for mobile. Fix a refresh issue with iOS when splitting blocks. Hook onBackSpace in RichText component. Introduce the ability to merge two blocks together on Backspace. Properly refresh blocks when merging them under iOS. Port nextpage block to the ReactNative mobile app. Deprecations removed with this version. I have tested 4.2 and as always: simply great work. What bothers me and other authors is that GBerg is extremely slow when you write long articles. I’ve been testing and experimenting with it since 4.0, but it’s definitely GBerg. Now only GBerg 4.2 installed but…. it’s slow and it’s hacking incredible. The old editor flows fine and fast. It’s GBerg! You lose the desire to write… -_- That would be a great thing if it was fixed for 5.0! It gets worse with nested blocks. I wonder if something like react-window or react-virtualized can be implemented to only render the blocks that are visible in the viewport. Are there any docs for how to use the new formats API? I’m struggling to find an example. My test 5.0 installation constantly shows that I can update to the latest nightly build, but when I allow it to update it still shows beta-2 ? Am I missing something obvious ? 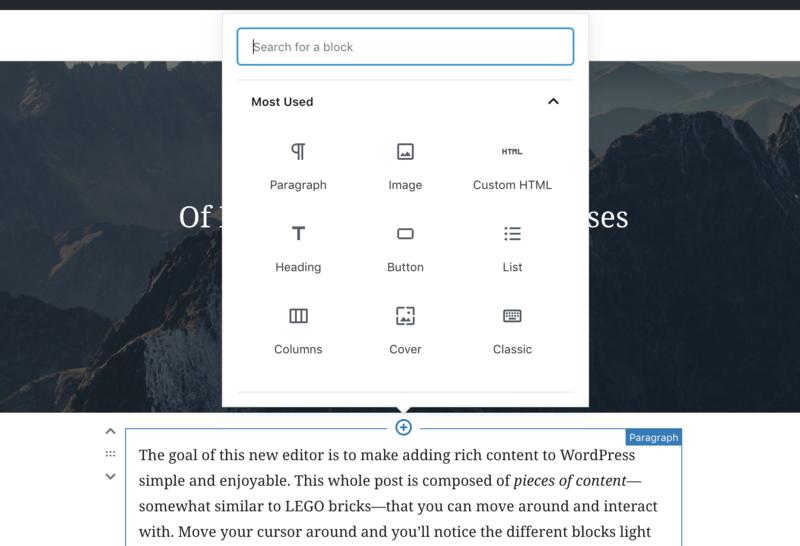 Also a question, does this update also update Gutenberg to 4.2 ? Ah, I see it is just released now – all good!